(Newser) – If Kim Jong Un's New Year's Day speech managed to warm South Korea, his stylist might deserve the praise. 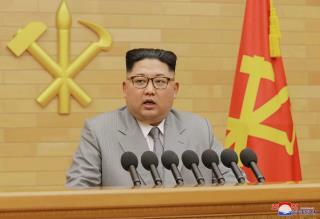 Kim chose to forego his usual navy and black suits and appeared in front of TV cameras in a light grey jacket and tie. The look—including rimmed glasses and slick hair cut above the ears—was more modern than usual for the North Korean leader, who spoke of melting "frozen North-South relations." But it was probably a political, rather than a personal, choice. With the New York Times noting South Korea is "known for its attention to outward appearances," Reuters reports the look "was likely carefully calculated to project a softer, more relaxed image to go with his surprise offer for talks with Seoul." While he gets a make over the people are starving.. what a scumbag. Didn't see any changed his suit. I really think he is trying to look like a lady with a butch haircut..